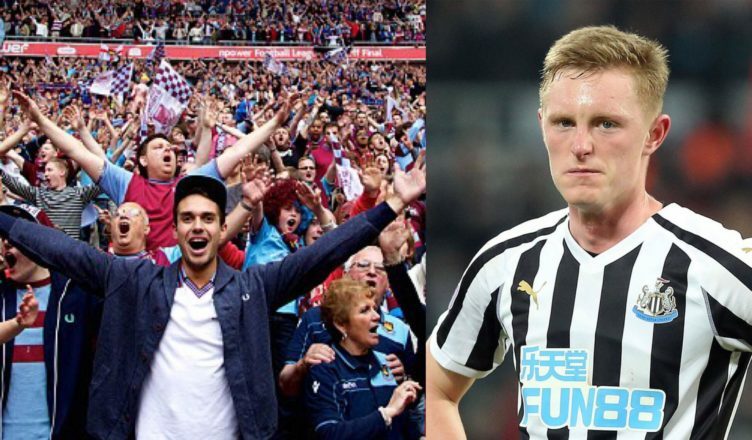 West Ham fans absolutely disgraceful after news of Sean Longstaff injury – Embarrassing.. – NUFC blog – Newcastle United blog – NUFC Fixtures, News and Forum. After news broke today that Sean Longstaff looks set to miss the remainder of the season, several West Ham fans have shown a real lack of class. This all stems from the tedious from Longstaff / Rice debate prior to last weekend’s game, but quite why both fans can’t just enjoy their own prospects, who are different styles of player at that, is beyond me. Celebrating a players injury? Bit weird. Not only have we seen all the above Tweets online but several West Ham fans are also commenting on NUFC posts with laughing faces – it is utterly bizarre. Rice does look an excellent player and one that looks set to thrive for England too. However, wishing another young player an injury is really poor and does just show a lack of class ; West Ham fans aren’t exactly covering themselves in glory here. I used to like West Ham and their supporters but now they have lost any respect I had for them. They no rank along all those Sunderland lot who were putting some terrible stuff about those two supporters who were killed in that aircrash and Sir Bobby when he died. I feel sorry for the teams (West Ham & Sunderland) having to put up with this type of supporter, they are better off without that kind of support! To all at NUFC, I can assure you 100% that 99% of West Ham fans wish your player all the very best on a full and speedy recovery and can only apologise for the vile comments posted by the few claiming to be Hammers fans. That is not what we are about and wish the Geordies all the best for the rest of the season in ensuring your stay in the Premier League where you truly belong. Don’t think its right to lable all West Ham fans as disgraceful over comments made by a few idiots. The vast majority like me will wish him a speedy recovery and that he has no long term effects. (I.e. Carroll). Come on you can’t tarnish us all with the same brush. Twitter brings out the ****s from all clubs walks of life.. Including Newcastle. I’ve seen plenty more west ham fans consoling the Longstaff injury and calling out these people for being wrong, than the tweets you’ve posted above. This would be the same with any club, so you should probably have a day off from having a pop at us. I wish him a speedy recovery and hope to see him and rice anchoring the England midfield for years to come. Fair play mate, although we have posted a tweet at the bottom of the article praising a classy response to Longstaff’s injury from a West Ham. Morons at every club Olly to be fair. Both these lads will be the future of English football hopefully .